Rafting: Gobind Sagar (Near Bilaspur), Chamera Lake (Near Dalhousie), Manali-Kullu (National Highway), Ravi (Near Chamba), Beas (Near Kullu), Chandrabhaga (Chenab) in Lahaul. The best white water rafting site is the 20 kilometres long stretch on the Beas River from Shamsi to Aut in Kullu district. Kayaking: Bhaga, Chenab, Zanskari, Parvati, Sutlej, Spiti, Chandra and Lahaul. If adventure enthusiasts truly want to discover the true hues of nature, then Himachal Pradesh is the place to be. With its distinctive topography, Himachal Pradesh offers a plethora of destinations where some of the best hair-raising activities can be enjoyed. Himachal Pradesh can stir up the spirits of the adventurers. During the summer and autumn season, people can enjoy the best of water sports activities in Himachal Pradesh. Snow and rain-fed rivers of Himachal Pradesh are so cold that it can chill the spines of adventurers. In Himachal Pradesh, water sports activities can be enjoyed in Sutlej, Chenab, Beas and Ravi River streams. Here, tourists can enjoy high-end rapids in these gushing rivers and rapid level is from IV to VI. Only chosen ones, who can pass the fitness test, are allowed to face the rapids in Himachal Pradesh. The river stretches in Himachal Pradesh become ferocious when they pass through the rocky cliffs and snow-capped mountains. 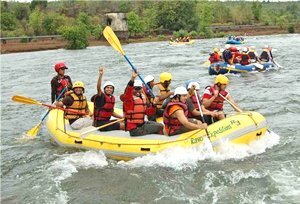 For white-water rafting, Gobind Sagar, Chamera Lake, Manali-Kullu, Ravi, Beas, and Chandrabhaga are some of the best places. One of the most exciting and challenging rivers to raft in the Indian Himalaya is Sutlej. Canoeing and sailing are some additional water sports which tourists can enjoy in Himachal Pradesh. Canoeing is usually done on still water of rivers and lakes. There are many still rivers in Himachal Pradesh to enjoy canoeing. The call of Himalaya is simply alluring. 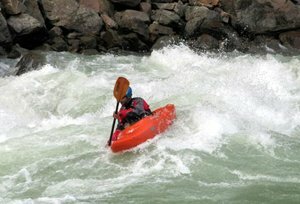 Other than rafting, kayaking is yet another popular aquatic sport which tourists can enjoy in Himachal Pradesh. Those who love to face the challenges of nature, kayaking in Himachal Pradesh is a treat for them. In Himachal Pradesh, only professionals are advised to participate in water sports. Atal Bihari Vajpayee Institute of Mountaineering and Allied Sports is a training institute where people can learn the basics of adventure activities. They also provide basic and advanced courses for all types of water sports. Slowly and steadily, Pong Dam Reservoir too has been able to find a spot on the adventure map of the country by sporting white river rafting on an increasing scale. The Pong Dam Reservoir is certainly the best place where visitors can indulge in Kayaking, Swimming, Sailing and Canoeing. Here is a call for the sports lovers! So pack your swimwear, snorkel and suntan lotion- and head for the beach. Go rafting and discover the beauty of the blubbering waters! Braving the river streams of Himachal Pradesh is not a child's play and yet the adrenaline gush that surges through the veins makes the risk worth taking.